Hello friends!! Hope, all of you are very well. Are you facing slowing problem in your firefox web browser? Do not worry. Today we will learn to speed up our Mozilla Firefox web browser. If you are using a broadband internet connection with firefox web browser, you can save the time of loading of each web page you visit. Do you want to know that how can you do it? Okay, just follow my instructions and read the post carefully. We will speed up our favorite Firefox browser by enabling pipelining. Pipelining will allow our browser to load more than one request at the same time of every page it loads. It was difficult to understand, is not it? Okay, let me make it easy to understand. Suppose you are visiting a web page that has dozens of images. In that case, normally firefox will load the images one by one, which can take a little more time to load. Enabling the pipelining, it will load more than one image at a time to make the web page appear faster than before. Hope, it is now clear enough to understand. 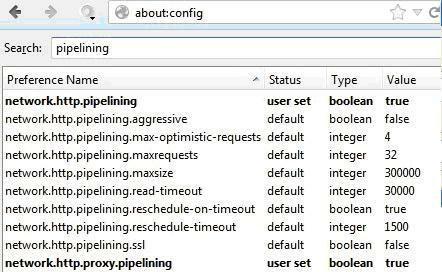 How to enable the pipelining in firefox web browser? 1. First of all, open your Mozilla Firefox Web Borwser. 2. On the address bar, type about:config and press enter. 3. A security warning will appear. Click on “I’ll be carefull, promise!” appear the next page. 4. Write pipelining on the search box as shown on the image below. 5. Double-click on network.http.pipelining to change its value to true. 6. 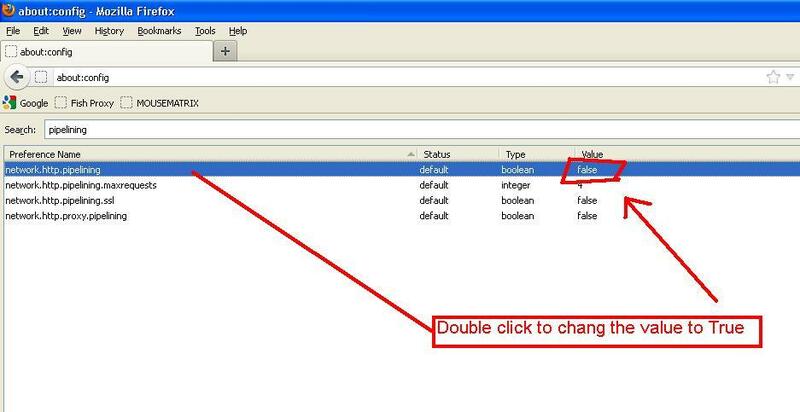 Double-click on network.http.proxy.pipelining to change the Value to true. 7. Then double click on network.http.pipelining.maxrequests. You will be asked to input a value. Change it to 30 so that it may handle 30 requests at a time. 8. Now Right click on an empty or blank section of the about:config window. Click on New > Integer. On the name section enter nglayout.initialpaint.delay as the name of the integer. On the next step input the value “0“. Done! Have you done all the tasks above? Okay. Now close and restart your browser. Check, your Firefox browser has become more faster than before to load pages. Now it is taking very little time to appear the web pages. Hope you have liked the trick. Thank you very much for reading the post. ? Are there such tricks for google chrome….? Due to its slow speed i always like to use Google Chrome but now after read your post and learn about the technicalities to increase its speed, i think i can use it now. Your shared information and tips are very helpful and perfect.